Everton vs Manchester City: Will the champions pounce on Liverpool's lapse? Manchester City can crank up the pressure in the Premier League title race by moving ahead of leaders Liverpool on goal difference with victory at Everton on Wednesday - but will the defending champions seize their chance? Back-to-back draws have allowed City to chip away at Liverpool's once seven-point lead and, by the time the Reds host Bournemouth at Anfield on Saturday, they could find themselves lying second in the table for the first time since December 22. Watch Everton vs Man City goals! If Manchester City are to retain the Premier League for the first time, they need to grab opportunities like the one on offer at Goodison Park with both hands, capitalise on Liverpool's blip and shift the pressure back on the leaders. 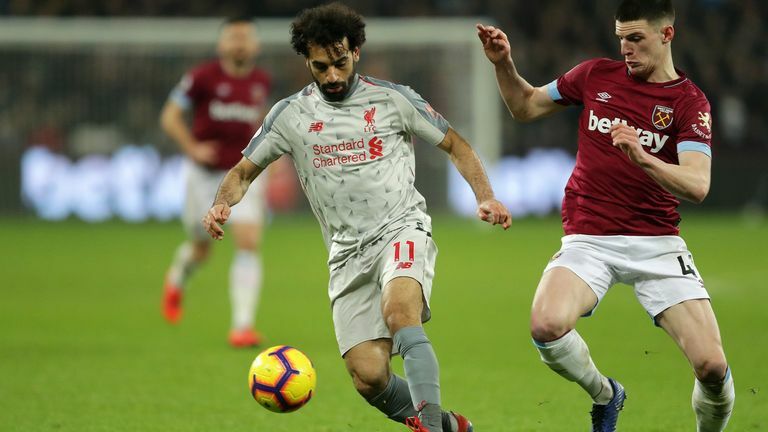 Liverpool's 1-1 draw at West Ham on Monday Night Football opened the door to the champions in the Premier League title race. The leaders were held at the London Stadium as they missed the chance to extend their lead at the top for the second game running. Instead of having a five-point lead, Liverpool sit just three clear of Manchester City, who can move level at the top with victory over Everton at Goodison Park. What condition are City in? The old adage says you're only as good as your last game which, in City's case, means the champions are in pretty good shape. They were breath-taking at times during Sunday's 3-1 victory over Arsenal, with the Gunners nearly blown away inside the opening 10 minutes at the Etihad. City then responded to Laurent Koscielny's shock equaliser with a dominant second-half performance to put the pressure back on leaders Liverpool. 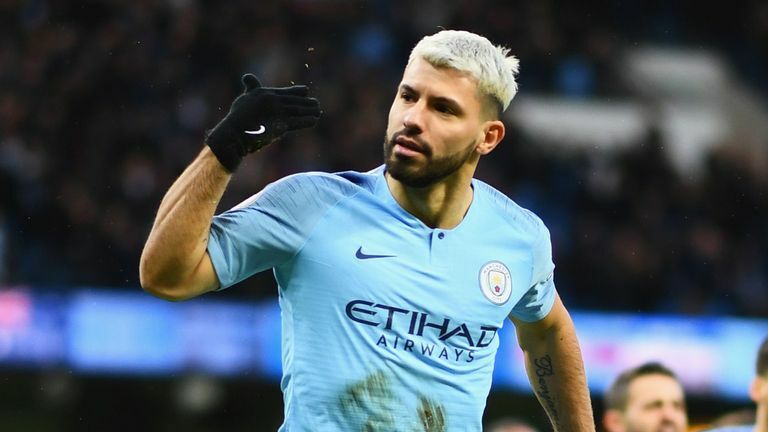 Sergio Aguero is in red-hot form after netting his 10th Premier League hat-trick, while Pep Guardiola has no fresh injury concerns ahead of the trip to Goodison, which is just as well ahead of the second of three Premier League games in seven days. Can Everton do Liverpool a favour? While Toffees fans may have second thoughts about aiding their closest rivals' bid for a first league title in 29 years, even the most ardent supporter would acknowledge the importance a big result against the champions could have on their inconsistent campaign. 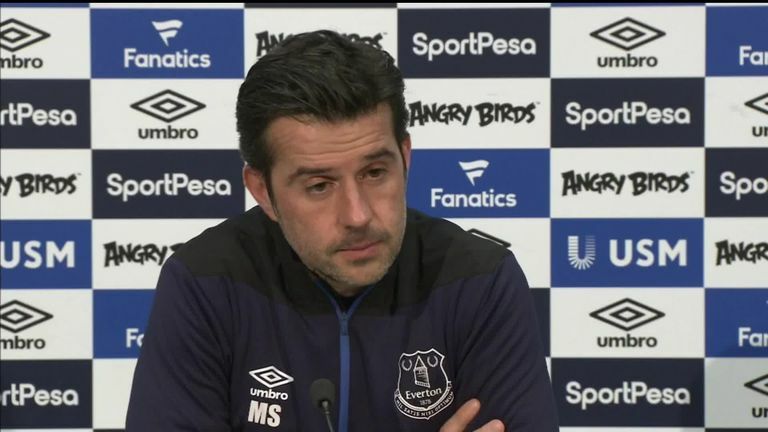 Everton manager Marco Silva says his team will not be in the mood to help Manchester City leapfrog their local rivals Liverpool in the Premier League. It would, of course, be naive to hinge this season's tight Premier League title race on events at Goodison on Wednesday, but if Everton can avoid defeat the balance of momentum will tip back into Liverpool's favour, with Jurgen Klopp side playing first this weekend. City have lost three of their last five Premier League away games, more than they had in their previous 34 on the road, but history suggests Everton have their work cut out. They have lost three of their last four Premier League home games - as many as they had in their previous 23 at Goodison Park - and have won just one of their last 11 Premier League games against Manchester City, that solitary win coming back in January 2017 when City lost 4-0 at Goodison Park. Will Marco Silva beat Pep Guardiola for the first time? Manchester City have opened the scoring a league-high 22 different times in the Premier League this season and no side has lost more games than City after scoring first this season (3). Everton have won none of their 11 Premier League games in which they've conceded first this season (D2 L9) - only Huddersfield have failed to win more often after conceding first (16). If Everton are to do their Merseyside neighbours a favour, you'd expect Gylfi Sigurdsson to play a key role. No Everton player has been involved in more goals for than the Iceland international this season, 10 goals and three assists, or registered more than his 42 shots on target. Sigurdsson has three goals and an assist to his name in nine career appearances against Manchester City, a tally the Toffees, and Liverpool, hope he will add to.